If you are shopping around, please note that these prices may be a little higher than you expect. 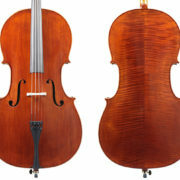 These cellos have been professionally adjusted to correct the typical faults they come with from the factories, and the factory strings have been replaced with quality strings. 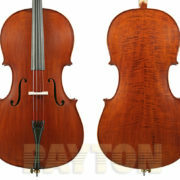 These cellos are ready to play, and include a warranty. If you need a donut or rosin, you can find them on the accessories page here. Enrico "Student Plus II" Series Cello Outfit including lightweight case with wheels. 1/8 to 4/4 size. 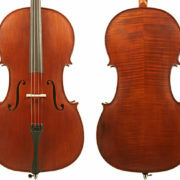 4/4 "Gliga III Series" Cello with nitro spray finish. School level instruments handcrafted in Romanian workshops. Outstanding value-for-money European instrument. All feature average grade sycamore maple back, neck and sides, similar grade resonance spruce top, ebony fingerboard and inlaid purfling. Salieri cello outfit 4/4 Spruce top, maple sides, back and neck. Supplied with quality bow, metal tailpiece and bag. Made in China. 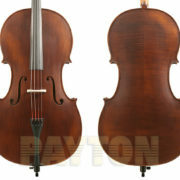 "Gliga I Series" cello in Dark Antique finish. Similar specifications to ‘Gliga II' but with better grade timbers and more handwork attention to plate thicknessing and outline contour on body and scroll producing an outstanding instrument for the advanced student. 1/4 size to 4/4.